In 2015, the majority of American adults indicated support for legalising marijuana in some form for the first time (Motel 2015). Eight states (containing 21% of the US population) have, or soon will have, operating markets for recreational marijuana. Canada, Colombia, the Netherlands, Spain, South Africa, and Uruguay have also legalised recreational marijuana in some form. The revenue from taxation has been one of the primary arguments for legalising marijuana (Miron and Zwiebel 1995). However, as the literature has focused on black market marijuana, little is known about behaviours in legal marijuana markets, and therefore what the optimal policies for revenue generation or social welfare may be. Indeed, legislators across states have implemented varied policies – Colorado requires retail firms to grow 80% of the product they sell, while Washington forbids retailers from growing at all. Washington’s current tax rate is 37%; Maine has a tax rate of 10%. In a recent paper, we offer new evidence concerning key policy-relevant behaviours by examining the market in Washington where recreational marijuana became available at retail stores beginning on 8 July 2014 (Hansen et al. 2017). We use comprehensive ‘seed-to-sale’ data collected by the state that track all marijuana produced in the state through the cultivation, production, and sales processes. We observe the prices, quality, and variety of marijuana products available in Washington’s marketplace. In contrast, previous studies of the marijuana industry have examined the illegal market through surveys, prices collected from drug seizures, and crowd-sourced data (e.g. Jacobi & Sovinsky 2016). We take advantage of a reform of Washington’s tax policy. Prior to 1 July 2015, a 25% gross receipts tax was assessed at each transfer of marijuana within the supply chain and at retail. After 1 July 2015, the only tax collected was a 37% excise tax at retail. Crucially, this change was unexpected by market participants – the reform was passed during a special session of the Washington Legislature on 27 June 2015, and signed by the governor on 30 June. We estimate the effect of this exogenous change on decisions made throughout the marketplace. Marijuana in Washington is produced through a legally defined three-step process. Cultivators raise cannabis plants, processors transform those plants into ‘usable marijuana’, and finally retailers sell small, sealed packages of marijuana to consumers. Under the original tax regime, vertically integrated firms that grow and process their own marijuana could have a competitive advantage by avoiding the 25% gross receipts tax that would normally be assessed on cultivator-processor transactions. We find that the original tax regime encouraged vertical integration within the supply chain where legal. We capture this behaviour by examining the provenance of retail marijuana products. 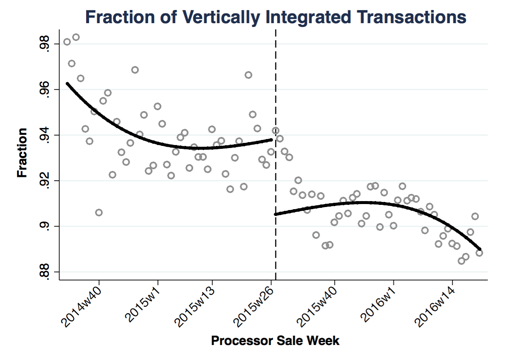 Before the reform, 94% of wholesale marijuana transactions were between vertically integrated producers and retailers, as seen in the left panel of Figure 1. Afterwards, roughly 90% of transactions originated from vertically integrated producers. At the same time, the weight of marijuana produced by non-vertically integrated firms increased 42%, as seen in the right panel of Figure 1. These results suggest that the original gross receipts tax created inefficiencies in the supply chain that persisted after the removal of the taxes. To test this hypothesis, we restrict the analysis to transactions from producers in their first week of business – that is, to capture firms’ decisions about vertical integration before paying the fixed costs of entry. 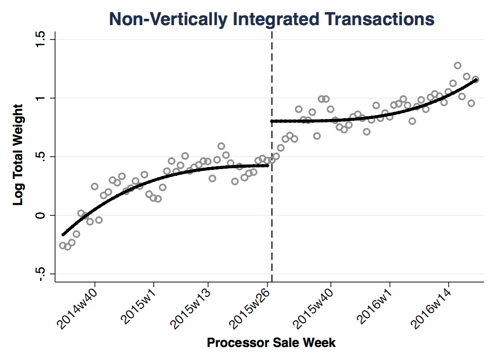 We find that the drop in the percentage of vertically integrated transactions quadruples to 16%, and the increase in the weight of dis-integrated marijuana more than doubles to 105%. Although economists have argued for many years that gross receipts taxes lead to vertical integration, we are the first to provide evidence of such behaviour. This is more relevant than ever for policy today, as several states have considered or have implemented such taxes (Kaeding 2017). Note: These figures demonstrate the trend and regime shift in vertical integration coinciding with taxation reform. Though seven (of eight) states with legal marijuana have a sales or excise tax, several states have also imposed cultivation taxes. Our findings suggest that cultivation taxes can directly affect incentives to vertically integrate. Additionally, Alaska’s and California’s cultivation taxes are based on weight alone, and Colorado’s wholesale tax is based on the average price per gram of marijuana sold in the state. As the amount taxed in those states does not change in response to the price of the wholesale marijuana sold, these taxes are relatively higher for cheaper marijuana, which tends to be of lower quality and potency. The tax regimes in Alaska, California, and Colorado may thus incentivise suppliers to produce higher priced and higher potency marijuana. While the price elasticity of demand and tax incidence are of first-order concern for policymakers tasked with setting taxes, the analysis is complicated by the degree of product differentiation – the typical retailer has many products available at any time. After accounting for substitution between products by consumers, we find that the tax-inclusive price faced by consumers for identical products increased by 2.3%. We find that the quantity purchased decreased by 0.95%, though estimates are noisy, implying a short-term price elasticity of -0.43. However, over time, the magnitude of the quantity response significantly increases, and our estimates suggest that the price elasticity of demand is about negative one within two weeks of the reform. We conclude that Washington, the state with the highest marijuana taxes in the country, is near the peak of the Laffer curve – further increases in tax rates may not increase revenue. We summarise the components of the average tax-inclusive retail price of a gram of marijuana in Figure 2. 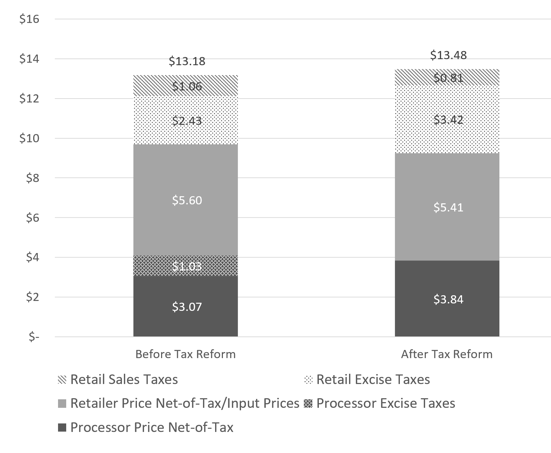 The left and right bars, respectively, present the components of the retail price before and after the tax change. We consider how much goes to processor and retail taxes as well as how much the firms keep. Before the tax change, all prices and taxes (in dollars) are based on the average prices across all firms the month prior to the tax change. The post-reform numbers are calculated by applying our estimated price responses to the pre-reform averages. This holds the composition of the market constant and eliminates any secular trends in prices as well as changes in the consumption patterns of consumers. Notes: In this figure, we plot the average retail firm’s price of one gram of marijuana both before and after the tax change. We then consider how much goes to processor and retail taxes as well as how much is spent to purchase a gram, on average, from the firm. Before the tax change, all prices and taxes (in dollars) are based on the average prices the month prior to the tax change. After the tax change, these numbers are the pre-tax change prices adjusted by our estimated changes caused by the tax changes. This holds constant the composition of the market and eliminates any secular trends in prices. Considering the changes in tax rates as well as the adjustment in retailers’ marginal costs (due to the change in processor prices in response to their own tax changes), we find that consumers bear about 44% of the retail tax burden. This result stands in contrast to the literatures on cigarette and gasoline tax incidence, which generally find that consumers bear a substantial majority of the tax burden (Harding et al. 2012, Kopczuk et al. 2016) and that the rate of tax pass-through to consumers can even exceed one (Barnett et al. 1996, Kenkel 2005). One plausible explanation for the difference is that our estimated medium-run elasticity of demand for marijuana is higher than the consensus estimates for cigarettes or gasoline. Alternatively, tight ownership and size restrictions in Washington’s marijuana market may lead to differential market power effects or frictions relative to these other markets. This difference could also be explained by the decline in the amount of federal income taxes some retail firms expected to pay upon the switch from a gross receipts tax to an excise tax. A simple analysis of excise tax revenue maximisation suggests that Washington, which has the highest tax rate out of all of the states which have legalised marijuana, is likely near the peak of the Laffer curve, and further tax increases may decrease marginal revenue received by the state. We have also highlighted that the type of tax imposed matters; a gross receipts tax on the cultivator will encourage vertical integration as a form of tax avoidance and thus lower expected revenue. Moreover, both the choice of the type of tax as well as what we tax (e.g. revenue or weight) have important implications for the way the industry evolves in terms of market structure and the types of products offered. This is particularly relevant due to the fledgling nature of the rapidly growing marijuana industry. Although tax revenue has historically been one of the many arguments in favour of legalising marijuana, evaluating the impact of marijuana policy (and constructing optimal policy) in a broader social sense requires additional considerations. For one, the public health externalities of marijuana consumption are not well established; nor is the relation between legal marijuana consumption and the consumption of other ‘sin’ goods, such as alcohol or tobacco. If it is indeed true, as many advocates claim, that marijuana consumption is ‘better’ in a public health sense than alcohol or tobacco consumption, the optimal taxation of marijuana should be designed to take into account responses in these other markets as well. Likewise, excessive taxation might prop up the very black markets that legal marijuana is intended to supplant. As additional jurisdictions consider legalising marijuana and debate over optimal policy design, these trade-offs should be explored and taken into account. Barnett, P G, T E Keeler and T W Hu (1995), “Oligopoly structure and the incidence of cigarette excise taxes”, Journal of Public Economics 57(3): 457-470. Hansen, B, K Miller and C Weber (2017), “The taxation of recreational marijuana: Evidence from Washington state”, NBER, Working paper 23632. Harding, M, E Leibtag and M F Lovenheim (2012), “The heterogeneous geographic and socioeconomic incidence of cigarette taxes: Evidence from Nielsen Homescan Data”, American Economic Journal: Economic Policy 4(4): 169-198. Jacobi, L and M Sovinsky (2016), “Marijuana on Main Street? Estimating demand in markets with limited access”, American Economic Review 106(8): 2009-45. Kaeding, N (2017), “The return of gross receipts taxes”, Tax Foundation, 28 March 2017. Kenkel, D S (2005), “Are alcohol tax hikes fully passed through to prices? Evidence from Alaska”, American Economic Review 95(2): 273-277. Kopczuk, W, J Marion, E Muehlegger and J Slemrod (2016), “Does tax-collection invariance hold? Evasion and the pass-through of State diesel taxes”, American Economic Journal: Economic Policy 8(2): 1-36. Miron, J A and J Zwiebel (1995), “The economic case against drug prohibition”, The Journal of Economic Perspectives 9(4): 175-192. Motel, S (2015), “Six Facts about Marjuana”.